A teenager at the center of a police brutality investigation last year has been arrested and accused of gang activity and drug possession. 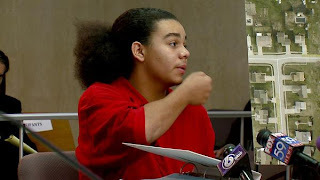 ﻿﻿However, a Marion County deputy prosecutor said the gang charge sought by police against Brandon Johnson likely will be dropped, and the youth's attorney described the police investigation as a vendetta. "There's been a pattern of harassment against him and his family," attorney Stephen Wagner said. "Had they (the police) done this to any other family, it would be considered outrageous." Indianapolis Metropolitan Police Department officers arrested Johnson, 16, and two older brothers on preliminary drug, gang and weapons charges during a raid Wednesday night in their Eastside home in the 7700 block of Mountain Stream Way. Johnson and Miketavious Jackson, 19, were charged preliminarily with felony and misdemeanor possession of marijuana and felony criminal gang activity, according to a police report. Terrell Jackson, 18, was preliminarily charged with felony criminal gang activity and misdemeanor dangerous possession of a firearm. Police said they seized an undisclosed amount of marijuana; a .357-caliber revolver; 14 bullets for the gun; a T-shirt and hooded sweatshirt with gang insignia; gang photos and paperwork; a police scanner; and a wooden plaque with a gang symbol. Fourteen IMPD officers conducted the raid and made the arrests. None of them was involved in Johnson's arrest in May on a disorderly conduct charge, when his face was bloodied and bruised. First, fourteen officers were involved in executing a search warrant? That's seems more than a little excessive. Now let's look at what was seized. It was claimed that the gun was the mother's. She supposedly has a hand gun license, although even that is not even necessary for her to have a gun in her home. One of her children though was charged with "misdemeanor dangerous possession of a firearm." Then you have a T-shirt and hooded sweatshirt with gang insignia, gang photos an paperwork and a wooden plaque with a gang symbol. It is not illegal to be in a gang nor is having items suggesting you are in a gang a crime. I feel fairly certain that any half-way experienced police officer would have known that, which makes it strange that Brandon Johnson was initially charged with felony gang activity, a charge the prosecutor's office now has to immediately and embarrassingly drop. The only item in the house that was illegal (assuming it was the mother's gun) that was confiscated was the "undisclosed amount of marijuana." The items that were actually seized - with the exception of the marijuana - were not evidence of a crime. So what items were identified in the search warrant that justified its issuance? Aren't there areas of town where you could raid 100 random homes and probably find marijuana in 20 of them? Heck, there are big wig executives of local companies here in town, people friendly to the mayor's office and political class, middle managers, CEOs, etc... who regularly smoke pot. Big deal. I never really got the attraction, but geez, just legalize that stuff and move on instead of ensuring that probably 1/5 of the population are criminals. It's a plant. Sean...I think society is heading that way. I can't wait to find out what they were claiming he had. It would seem they got in there and just started grabbing things to justify doing what they were doing. Sean, I totally agree. I get sick of seeing people go to jail for smoking a joint. Believe me, as someone who doesn't smoke, drink or do drugs, it has been hard for me to come to that conclusion. But the war on drugs is a sham and the undue focus on marijuana has ruined too many people's lives. It would be interesting to see what was listed in the search warrant, and whether that matched what they found. This clearly looks like abuse of power was at play and it stinks to high heaven! Which search warrant do you want to see? The one written after the raid will probably contain suspicion of marijuana, a .357 and 14 rounds of ammunition. I thought I had read something about an attempt to crash a party with some gunfire involved leading to this? Paul, I totaly disagree wity you on this one. I think that Ballard has build this kid up so high that he thinks that no one can touch him. He will get off with nothing.If the police did comething to him, it would embarris the Mayor. Paul, I get the fact that you odnt like the cops,but they fact is thiskid is a low life gangsta abd thinks that he can get a free ride. I don't like cops? What in the world are you talking about? I'd be curious as to why you think that. I did post about my niece getting pulled over by an IMPD officer and questioned why she was driving through the mostly black neighborhood. She was handcuffed placed at the rear of the car while her car was searched...even though she wasn't even accused of doing so much as a traffic offense. I'm curious if you would give this behavior a pass. Cops have a terribly difficult job. We should all respect them for the work they do. But we shouldn't look the other way when they're doing things they shouldn't be doing. Surely you admit there are times when police officers go too far. Why did they use 14 police officers to execute a search warrant? Why did they seize things they knew weren't illegal to try to fashion a "gang activity" charge that even a rookie police officer would know you would have to drop. "Surely you admit there are times when police officers go too far." Such an admission makes you anti-cop. Exalted, unaccountable, unquestioned, obeyed. That's how you must view police to be "pro-cop." I think I forgot to ask...why did they seize a police scanner? A police scanner is not illegal. TV stations have police scanners. Are they next to be busted?